Peacefully at home, with family by her side on Tuesday, April 9, 2019. 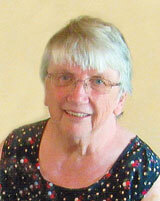 Bernice Mary Margaret DeMarsh (nee Kidd) of Erinsville at age 74. Beloved wife of the late Maurice DeMarsh. Dear mother of Anthony (Kellie) of Stirling; Don (Alison) of Erinsville; Darlene Payne-DeMarsh (Peter) of Kingston and Sister Lisa DeMarsh of Zephyr, ON. Grandmother of Meredith; Shawna; Isabel; Kyle; Meranda; Jessica and the late Ian DeMarsh. Great-grandmother of Ronan Richardson. Predeceased by her parents Joe and Ellen Kidd. The family Will Receive Friends At The Hannah Funeral Home, in Tamworth on Thursday, April 11 from 2-4 and 7-9 p.m., Mass of Christian Burial at the Church of the Assumption in Erinsville on Friday, April 12 at 11:00 a.m. Interment Assumption Cemetery. Memorial donations made to the Assumption Church Building Fund or Stone Mills Township (Tamworth Fire Station) would be appreciated by the family.